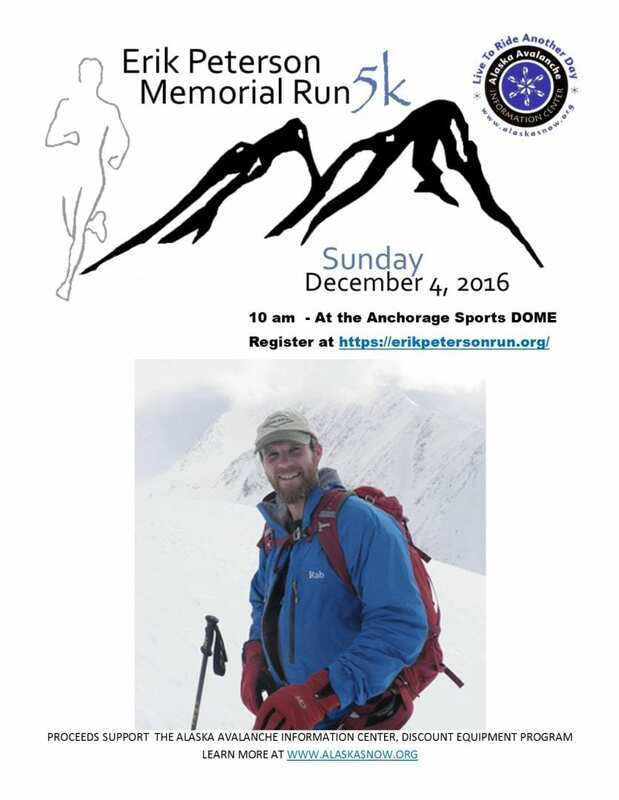 On a bitter cold Sunday morning, December 4, 2016, dozens of families, friends, high school and college students and others turned out at The Anchorage Sports Dome to honor the memory of Erik Peterson, their much-loved teacher, coach, and friend who was killed in an avalanche on December 6, 2014. This event is a fundraiser to support the Alaska Avalanche Information Center. There were 45 finishers of the 3.1 mile race. Daniel Bausch was the men’s top finisher in 16 minutes, 44 seconds. Sarah Freistone took first place in the women’s division with a winning time of 21 minutes, 45 seconds. Numerous media stations including KTVA, KTUU, KIMO television, Alaska Dispatch News reporting staff and numerous radio stations covered the race through interviews with Tonya Parish, the race organizer, and Chris Constant, a volunteer with the Alaska Avalanche Information Center (AAIC). In addition feature stories on the event were published in Alaska Coast Magazine and the People’s Paper. Alaska Avalanche Information Center staff were on hand to provide information and offer discounted safety equipment for sale to benefit the memorial fund. The Erik Peterson Memorial Fund and Race started in 2015 by a group of his former students, led by Tonya Parish, to honor his memory and raise awareness of the potential hazards as well as resources to avoid danger. Parents of Erik’s former students as well as school district teachers and staff are also very supportive and involved in this fundraising event to honor Erik’s kind and dedicated spirit that influenced so many of his students. Donations to the Erik Peterson Memorial Fund allow the Alaska Avalanche Information Center to promote avalanche awareness and education through classes available to the public, as well as offer avalanche kits (beacon, probe, shovel), at a reduced rate to the general public. The goal is to increase the number of individuals carrying this equipment in the backcountry. In 2016, Alaska Avalanche Information Center received a total of $3,342.00 in donations to the Erik Peterson Memorial Fund. In 2015 the event raised $2,881.00 and funds were used to purchase safety equipment which has been distributed to individuals through event awards and discount sales.